We are getting to know our diverse and international group of individuals in the Buena Onda Yoga community. Already having introduced Christine, Jess and Amie, we switch our focus towards Norma. Just a heads up - because Norma is Argentine we decided to give you both the Spanish and English edition. Maybe you`re even learning Spanish and find this as a nice challenge! Q. How long have you been practicing yoga? A. Mi primera práctica de yoga fué a mis 18 años (hoy tengo 52), sin tener idea de qué se trataba, mi mamá practicaba y aún continúa, probé una clase y me encantó. Siempre me quedó esa sensación de paz, aún habiendo movido "todo" mi cuerpo. Seguí practicando con intervalos, hasta que finalmente en 2009 hice el profesorado. Luego en 2012 hice Yogaterapia, y sigo perfeccionándome participando en talleres y tomando clases con otros profesores. I first started practicing yoga at the age of 18 (today I am 52), without having much idea what it was. But my mom practiced , and still does, which inspired me to try a class. And I loved it. Despite being a very physical practice, it has always given me a feeling of peace. I continued practicing yoga on and off, until I finally became an instructor in 2009. I also studied yoga therapy in 2012, and continuously work on self improvement by participating in workshops and taking classes with other teachers. Q. What did yoga change for you? A. 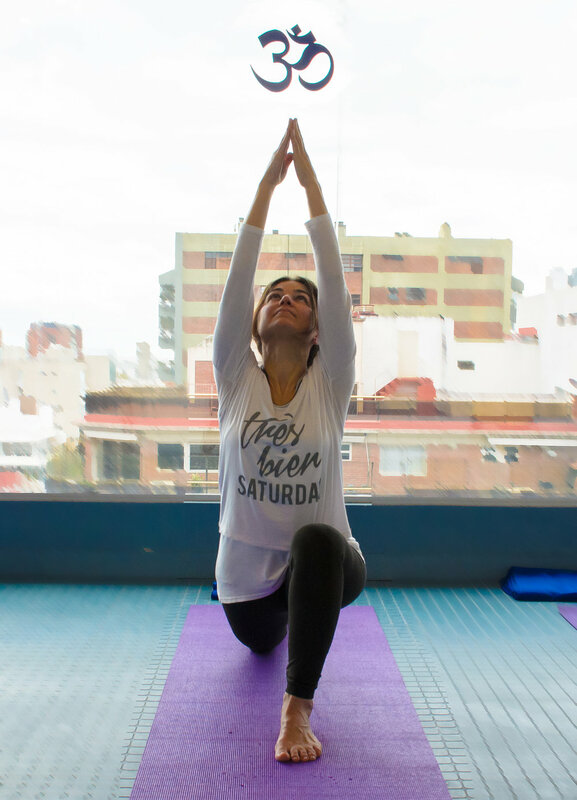 La práctica de yoga me cambió mi modo de vida. Mi modo de ver, de sentir/me, de comunicarme y relacionarme con mi entorno. Gracias a la práctica del equilibrio. The practice of yoga has changed my way of living. My way of seeing, feeling, communicating and relating to my environment. Thanks to the practice of balance. A. Conocí BOY como alumna, me interesaba la práctica de yoga con profesoras extranjeras, para poder practicar el idioma Inglés que lo estudié muchos años de chica, pero lo puse poco en práctica. Las clases de Vinyasa me encantaron. Recuerdo en ese momento tomé clases con Frances Ren. Luego me ofrecieron dar clases y aquí estoy los lunes dando la clase en Español, o Spanglish, como me gusta decirlo, para quienes quieran practicar español. I found BOY as a student. I was interested in practicing yoga with foreign teachers, to practice speaking the English language I had studied for years but hardly ever practiced. I loved the Vinyasa classes. I remember at that time I took classes with Frances Ren. I got the offer to teach, and here I am every Monday giving the Spanish class, or Spanglish, as I like to say, for those who want to practice Spanish. Q. A thing or two you appreciate about Buenos Aires / Argentina? A. Como Argentina, me cuesta verla con ojos extranjeros. Por eso siempre digo que "me siento extranjera" dando las clases en BOY... jaja! Pero volviendo a la pregunta, Buenos Aires / Argentina tiene algo especial, una movida cultural, nocturna, y de bares acogedores, que me parece que nos diferencia del resto. Somos expresivos y muy temperamentales, supongo que debido la mezcla de la inmigración de Italianos y Españoles, nos dejaron ese cocktail explosivo y muy característico, principalmente en los porteños. Y por supuesto el mate! Being Argentine I find it hard to see it with foreign eyes. That's why I always say that "I feel foreign" giving classes for BOY haha. But going back to the question, Buenos Aires / Argentina has something special - a cultural movement, the nightlife and friendly pubs, which I think differentiates the city from others. We are expressive and very temperamental, I suppose due to the mixture of immigration of Italians and Spanish whom left us this explosive and very characteristic cocktail, mainly in the porteños. And of course the Mate! A. Las cosas simples, mis afectos (familia, amigos, mascotas) la naturaleza, y su cuidado. Disfruto de mi devenir día a día, tratando de mejorar mi forma de ser. Disfruto de mi trabajo como diseñador gráfico, como profesor de yoga y tocando música. The simple things, nature, my loved ones (family, friends, pets) and their well being. I enjoy my own becoming day by day, trying to improve my way of being. I enjoy my work as a graphic designer, as a yoga teacher and making music.